His Holiness the 17th Karmapa, Ogyen Trinley Dorje, addressed students and faculty of the Ambedkar University Delhi on 3rd Oct on a range of topics relating to emotional wellbeing. After a brief opening address to the packed hall at the university’s Kashmere Gate campus, the Karmapa engaged in extended dialogue with MPhil students from a number of departments. 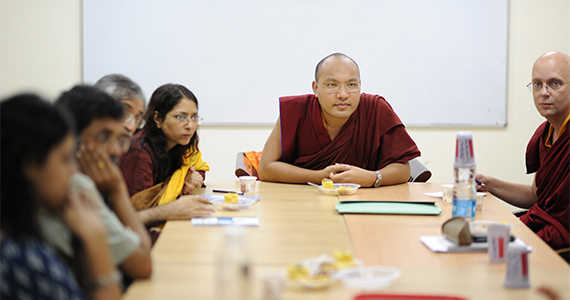 This interaction at Ambedkar University Delhi marked the Karmapa’s first major visit to a university in India. Known for its commitment to social justice, Ambedkar University Delhi is the first university in the region dedicated entirely to postgraduate education and research in the social sciences and humanities. Describing the ideal spiritual practitioner, or bodhisattva, as “an activist working solely for others”, the Karmapa explored the responsibility we have to care for others with whom we share the global village. He particularly addressed the way that clinging to our identities can separate human beings and impede the development of love and compassion. “When we cease to see ourselves as separate, we do not disappear, but rather we see ourselves as part of others,” the Karmapa said. Otherwise, as long as we hold to our separate identities, divisions and selfishness inevitably arise and love cannot flourish, he said. Halfway into the interaction with the students, the Karmapa particularly invited women to participate fully in the discussion, observing that only male students and no women had asked questions up to that point. The Karmapa’s address was delivered at the invitation of the Department of Psychology, with students from the development practices, education, human ecology, psychology and sociology departments also participating. Professor Dr. Honey Oberoi Vahali, Dean of the School of Human Studies, commented that the interaction with the Karmapa was the most lively she had ever seen in that hall. The Vice Chancellor noted that the university generally restricts itself to matters of rational and empirical study and does not often address matters pertaining to spirituality and the self. He observed that these areas of human activity have too often been appropriated by zealots and sectarians. “We need to re-appropriate these two as resources and not allow these important aspects to become distorted,” the Vice Chancellor said.